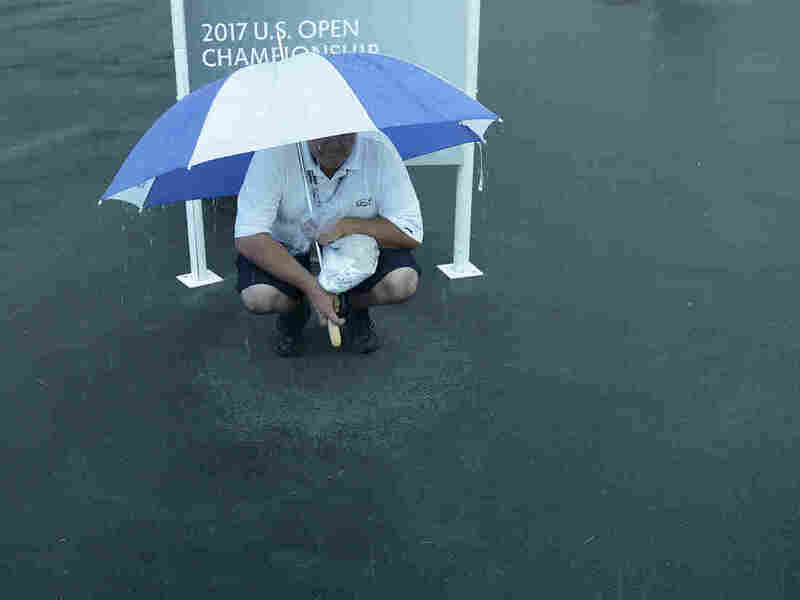 Will Rain-Disrupted U.S. Open Be Too Easy Or Hard As Ever? : The Two-Way Conventional wisdom is that soggy greens will make it easier for player. But past Open champ Johnny Miller says that's just not right. He also thinks the Merion Golf Club course is going to prove to be much harder than players expect. A man finds some shelter from the rain Thursday at the U.S. Open, which is being played at Merion Golf Club in Ardmore, Pa.
After being suspended less than two hours after the first players teed off, play is set to resume early Thursday afternoon at the U.S. Open golf championship, which this year is being held at the Merion Golf Club in Ardmore, Pa., outside Philadelphia. Heavy rains forced the delay. Thursday on Morning Edition, USA Today's Christine Brennan made the case — as other observers have — that soggy conditions at Merion mean there could be some extremely low scores this weekend. Basically, the thinking is that the greens will be wet and soft. So, Brennan said, players "will be able to play target golf." Shots they aim at the holes will hit the greens and roll very little, if at all. Wednesday on ESPN's Pardon the Interruption a guy who has won a U.S. Open dismissed such talk. According to 1973 Open champ Johnny Miller, who's now an analyst for NBC and The Golf Channel, "this course has always been underestimated" and the players are going to find it's very difficult. The rough along the fairways, Miller said, "is the toughest rough that these guys — these young guys — have ever seen" because it's high and dense. And he doesn't think balls hit to the greens will necessarily stay near where they land. Wet conditions also tend to add to the amount of spin put on the balls when they're struck. "The backspin — because everything's wet — the guys are hitting near the pin and it's spinning back 30 feet," he said. Finally, Miller said the course has "so many hard holes ... seven holes that are really, really hard ... maybe even eight." Who's right? NBC-TV and The Golf Channel are doing the broadcasts if you're anxious to see. Who's the favorite to win? As always, many eyes are on Tiger Woods.